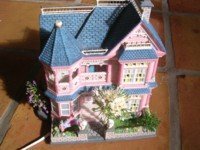 As we begin our search of mini houses we find Victorian doll houses becoming prominent in the mid 1800's. Many were made of very light weight material resembling cardboard. They were made this way so as to fold and fit nicely into a box for transport. Some designs had no outer walls allowing multiple children access to their own private playing compartments at the same time. These houses stood on a table and were designed like a gigantic "X". Many structures like them today advertise this same "multiple children can play" feature. Basically speaking, what child who owns a doll's house really wants to play all alone, anyway? So this is a good feature to keep in mind with any future purchase you will make. "A dollhouse is a home, made in miniature." A lot of tiny houses from the Victorian fashion history era as well sported amazing flooring designs. The colors were simply brilliant. However as with today, there were other designs that were just black and white. So in each generation there will always be people who design "Great Toy Mansions" and others who simply design an every day dollshouse. The structures of all past fashion history eras do include one particular characteristic. This characteristic being that the houses all are crafted in the style of the times in which they were created, such as the Queen Anne miniature house. So whatever life-like styles were present at any one period in history you will usually find the same structural components present in miniatures too. The fashion history of miniatures is not so limiting today, though. Today we can find people working on an authentic antique collection. Making everything for it in period detail. Or at the same time we can also find someone working on a "very now" design. Today I guess you can cheerfully say, it's all up to you and your own desire that dictates what kind of miniature home you will own. In other words, to each his own. From Past Eras - Collectors can use older antique catalogue listings that are available, to help date and authenticate the pieces in their miniature antique collections. These are very much collector's items today. American and German producers were competing in the minis market at that time. Effectually helping the fashion history in this toy market be established in it's tiny beginnings. "While the one or two storey structures showed interesting printed exteriors, some of the interiors can be disappointing, as there may be no cut-out windows, actual stairs or doors." Quote from Miniature Toy History online. Printed cardboard became popular again around the 1920's. However we don't see the arrival of plastic styles until the late 1940's. This material made the toy industry explode, seeing as plastic is such a amenable material in aiding mass production in this industry. About the 1950s we see evidence of metal building material in tiny structures. Along with wood furnishings. The attention to detail was fantastic. There truly were some great artisans at that time. As of course there are now also. This brings us up to our current era where you can find just about any design you long for, . . . from antique miniature houses to custom built structures. There are no limits today. You can just about order up any item you want. Factory made or collector. The modern toy industry has seen it's evolution in craftsmanship and material. It just keeps getting better as time goes on. But isn't that what we all hope for anyway? The best of the best mini mansion ever! One of the best designs ever created was that of the fashion doll house. I guess I'm biased in favor and always will be. Barbie still does it for me. She's my fav! Also one of the most famous miniature houses ever created was Queen Mary's Dollhouse featured in pictures here.